As I read financial blogs, I find that a lot of bloggers seem to like to pay for everything with their credit card. Why not, they ask? You can get rewards or cash back, the credit card company tracks all your purchases for you and may even show you a yearly statement indicating the percents you spent on that card in various categories. Credit cards are handy in a lot of situations. If you travel, you no longer need to get travelers checks to make sure you can handle emergencies. Online shopping screams for a credit card transaction. Credit transactions are somewhat protected. However, you can pay cash for online purchases. Walmart has a program where you can order online, print a receipt and pay within 24 hours at a local store. Other options, such as CashPayment and CoinStar also exist. Why bother going to the bank to get cold hard cash, when you can just charge it? Time author Martha C. White in 5 Times you should always pay cash, seems to think that for the most part, you should pay cash to help out the little guy – so they don’t get hit up with all the credit card processing fees, or so the waiter can have his tip today. I have other reasons. Here is why I use cash in certain situations. It keeps me from spending more. If you know you are going to have to refill the till (i.e. hit the bank for more cash), you probably are going to keep close tabs on what you are spending. If you are growing short, you may decide not to stop at Dairy Queen to buy a round of ice creams for the team – if you have to part with cold hard cash. Every credit, debit and check transaction is traceable back to you. Most of the time, most of us don’t care if there is a database somewhere that says “Marie bought a 12 roll pack of toilet paper on 2/10/13 at a certain Walmart for a certain dollar amount. But, there may come a time when we regret having every detail of every transaction in our life available for review. If you pay with bills, no one will know what you are buying. It is a privacy issue. It is accepted most everywhere. At least now, in 2013, there are still places that do not accept credit, or may not accept the credit card you have. We visited Clinton Missouri with our kids a while ago. We stopped for lunch at the local branch of a national franchise. My son tried to pay with credit, they said no. He tried to find an ATM, there wasn’t one close by. Luckily we were there and covered his bill. There is no possibility of a screw up with cash. Your cash won’t be refused, as a credit card can be. No one can hack into your cash account and spend it for you. You don’t get the ‘credit card hangover’. Although we enjoy the convenience of shopping online and do use credit cards to do so, we hate it when the bill comes for something we have already used up or given as a gift. It feels like a hangover, paying for things you already have received! You learn cash flow management. With a credit card, you don’t have to be accountable for your cash flow. Using cash forces you to understand the cash you have available to spend. There are some businesses, according to BankRate, that encourage use of cash and which give a discount if you pay with it. You have a psychological advantage. If you are in a negotiation situation, and can flash the cash, you have a psychological advantage over your counterpart. Seeing the cash makes it easier for the other guy to agree to your terms at times. Do you use cash? Why or why not? I put everything on a credit card for rewards. Since I don’t have a shopping problem, this really isn’t a problem for me. I always seem to spend/lose cash!!! I guess that works, as long as you pay off the card each period so you don’t incur those awful interest rates. Marie! Holly certainly makes a good case for credit card use. But Tammy and I have a good mix of the 2. We use cash for fun stuff – drinkies, eat outs,etc. The credit card is used for automated payments and emergency purchases or bigger purchases. Love your arguments for cash though and helping the little guy like the tiny Lebanese place we dine at is nice! Yeah, I’m sorry, but I just don’t understand someone losing cash. To me it is part of being fiscally responsible. For us, using the credit cards for bill payment is just moving the bill around, not paying it off. Sorry Marie. I was unclear. We use the credit card for bills that we could not get a simple direct online pay like our power bill because it is different each month. Have a super marvy day!!!! I use credit mostly. I find myself spending much more when I have cash. I’m not sure how that would work. If you don’t have the cash, how can you spend it. I use to only use cash before I got married. It worked well for me. I would take out money for the week and would have to make sure that amount lasted until Friday. For the weekend I would do the same and it forced me to make better decisions about what I wanted and should spend money one. I tried it when I got married but wife would always end up spending the cash that i left out so it to the debit card I went. I think you can make points for cash though a lot of people would end up spending more and just going to the ATM and getting charged fees. We don’t use ATMS so have no fees. Finally, someone else who uses cash – I was beginning to think I was the only one left! I am also a big fan of credit cards to get points but I also carry cash with me. There are some stores that will give a discount for cash. Some smaller stores don’t accept credit unless you spend a certain amount and I do feel bad using credit at a mom and pop store if I’m only spending a few bucks. I know the banks really hit them hard with fees. I don’t feel bad about it when it’s a big retail store though! Not sure why folks think about them differently, the big retail stores have a real person managing them too…. I think of them differently because I am more sympathetic to a small mom and pop store’s small profit margin whereas I just don’t feel that with Walmart. I’m sure they’re doing just fine whether or not I use my credit card. I don’t know, maybe that’s just me. We use cash too. It’s too easy to overspend on credit cards. We tried both ways and I know I spend less with cash. I mostly use a credit card for 2 reasons~ It helps ME track my spending without writing everything down and I get cash rewards from my credit card, which really mount up! I track my credit card spending and when I reach my limit for the month, that’s it! Since I pay the account in full every month, without fail, I never pay any interest, just get cash back for using the card. One other benefit is that some stores (such as Home Depot) will give you a credit directly to your account for returns, because they can find your purchase by scanning your card. How do you track spending as you go without writing it down? I keep a basic running total of what I’ve charged in my head. I set a low limit on the website, so I get a daily email from the credit card company (Chase) every day, telling me what my balance is. I can check the website at any time, to see what I’ve spent & where. Then when I get my monthly statement I have a permanent record of what I spent that month. So basically they pay ME to use the credit card. I pay no interest & they pay me cash rewards~ I like that! However, I DO carry some cash for small purchases. I sometimes use cash, but most often I prefer to use my credit card there are lots of benefits. I make sure to buy only the things that are necessary and to set my own limit when it comes to spending, so I haven’t encounter any problems that comes with the having credit cards. Lots of people do not have your ability to limit spending. I have to admit most times everything goes on credit cards but I do keep $20 at least in my wallet if I can just in case. I would hate to have a problem with my credit card and have to waste more time going to get cash. It’s a tough spot to be in deciding. 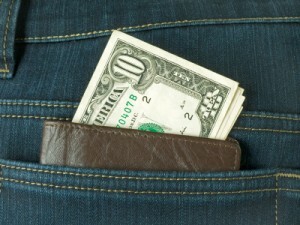 Obviously, I think it prudent to keep some cash handy – so – good for you! I make thousands of dollars annually from Credit Card cashback and travel for free, typically in Business Class internationally, staying in 5 star hotels. All it takes is a little control. The upside far outweighs the risk. How much time does it take to manage the rewards and points? I pay the bills using autopay, and I track the reward points using Awardwallet, which stores all the account data for me. The cash I invest in fidelity. I hope to save enough cashback this year to fully fund a ROTH IRA for free. Total time? 2 minutes to setup autopay and setup awardwallet. Excellent point about traceability, never thought of that! May start using cash from now on for that reason alone! Hubby really likes that feature too. I don’t mind too much the privacy issue. But my card has been declined a couple of times when I traveled to a new country and hadn’t let the bank know, those times I really wished I had cash! Here in Guatemala I use it every time there is a discount, and many shops are too small to accept cards, but I pay by card whenever possible. Both cash and credit are, after all, just tools – sounds like you are using them as just that. Good one, Marie! I did this for about a year – paid for everything using cash and the discipline one developes is unbelievable. Ithink even when people revert to cashless transactions they should do this as an exercise to get back to good habits. Thanks Maria. Part of my comfort with cash is probably due to how I was raised. Another reason: Fewer transactions to have to check and reconcile when the bill comes in. I recently switched from charging EVERYTHING humanly possible to paying cash for transactions up to $30. It cuts the number of entries on the monthly AMEX bill — thereby simplifying life a bit — and interestingly, it does seem to be helping to curb the spending. I hate diddling away cash! I hadn’t thought of that one, good point.